Our theory is to make sure our home isn’t exactly like a page from some catalogue. We change that crap up, Customize, Make it our own…..
Our previous kitchen cabinets were just shy of fitting completely over our washer/dryer. 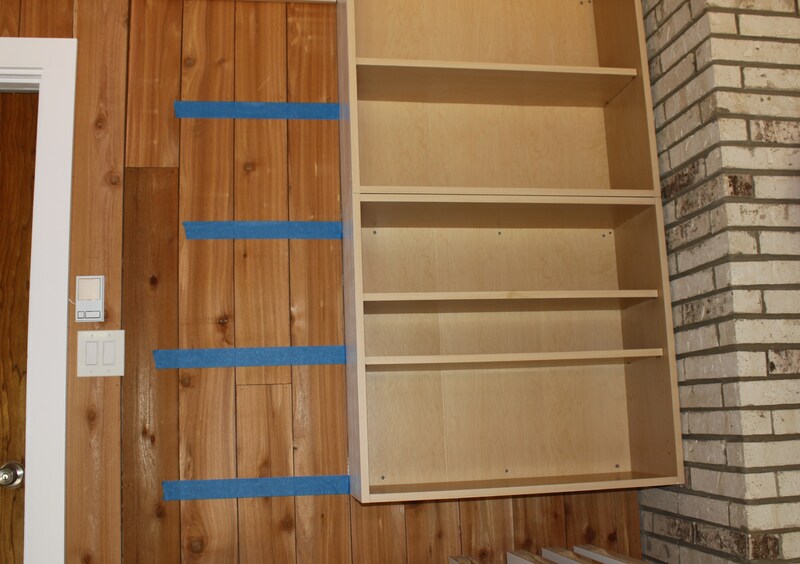 The space left on the side of the upcycled cabinets was about 21 – 23 inches. 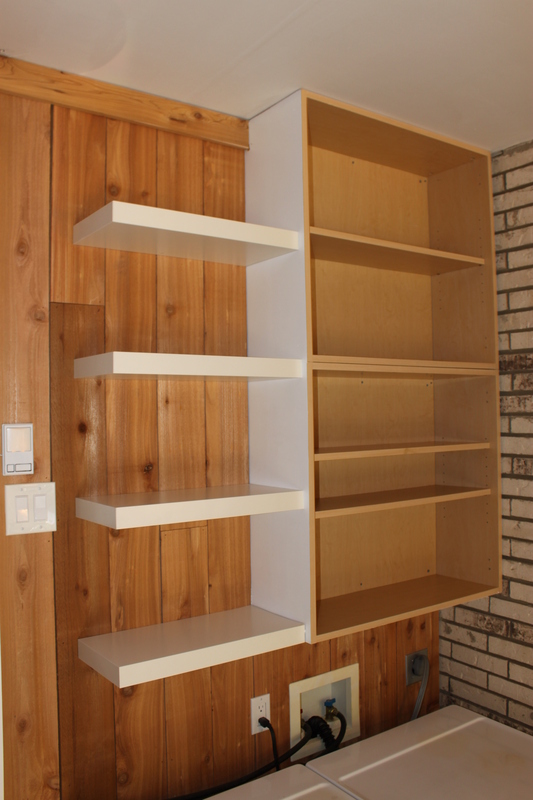 Ikea Lack shelves are extremely popular, so modern and sleek. 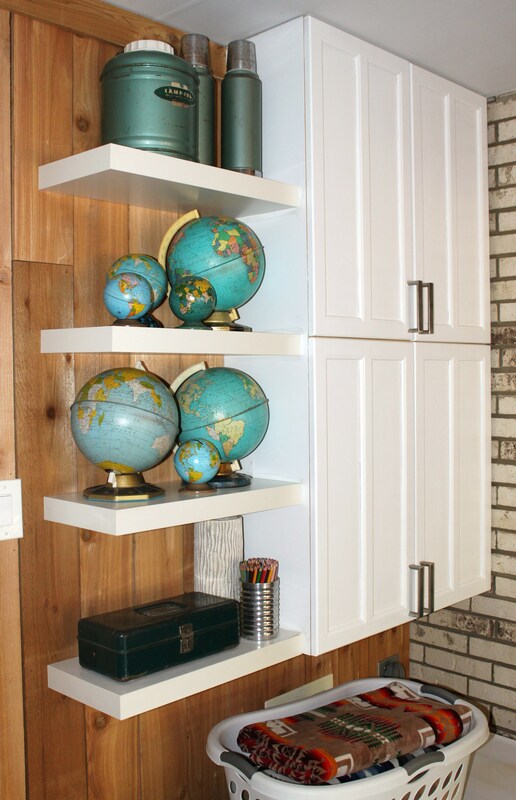 We love that the mounting hardware is hidden inside the shelf. But the sizes are just so limited; AND Ikea neglects to mention is that these shelves only hold about 25 pounds (distributed perfectly evenly) before they sag or fall off the wall completely. OUCH! We found an answer to both problems. We hacked them in half. We bought 43 inch Lack shelves and chop-sawed them in half. At 15 bucks each, 2 shelves gave us 4 smaller ones at about 21 1/2 inches, almost too perfect. There’s a metal bracket inside every shelf (this holds them to the wall, of course). It took a little more work to cut the brackets in half with a hand saw, but eventually it happened. 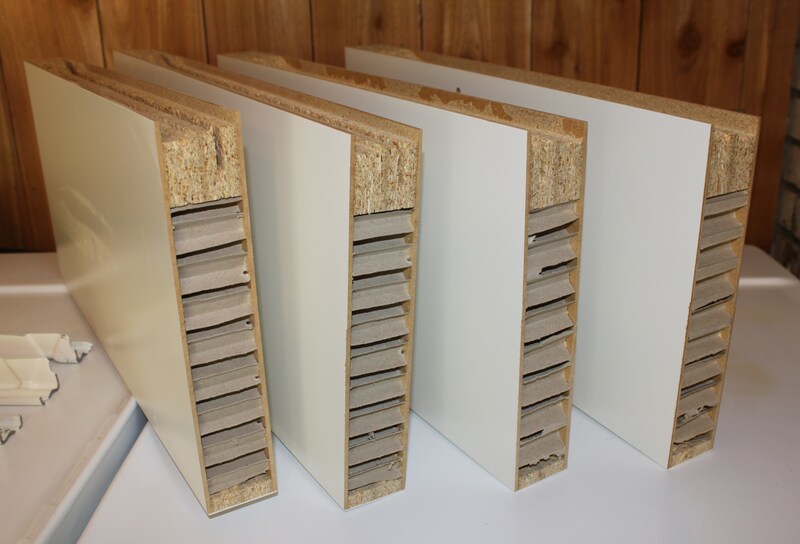 Here’s what all the cardboard sandwiched between laminate veneer inside an Ikea Lack shelf looks like…. But see that little bit of fiberboard at the top and bottom? Remember that part for later…. I marked my spacing on the wall with the painters tape, 12 inches apart. The shelves are about 2 inches thick, so I used 2 inch painters tape. So simple, but still bears pointing out. With the level, I positioned the half bracket as close to the wall cabinet as I could, and screwed right into the studs. I knew where my studs were (every 16 inches) but used several screws just to be safe. There is the only one tricky part. Because I want all my cut shelf edges against the cabinet, I had to install 2 of the brackets (and shelves) upside down. Not too complicated. I just had to remember this detail before I got into the full swing of “bracket attaching”. 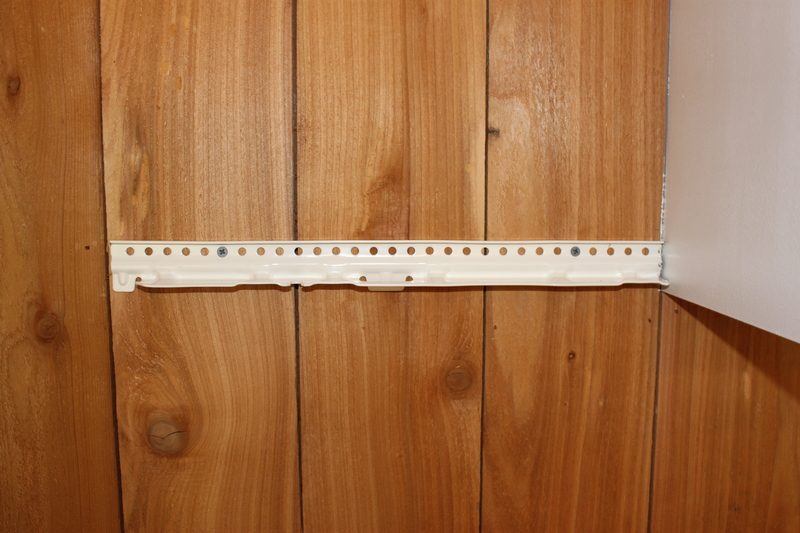 Then, just to secure them, I screwed a couple of drywall screws into the side of my shelf…..from inside the cabinet. A screw into the cardboard won’t do anything. Remember that fiberboard part of the cut shelf? That’s where I was aiming. One in the front and one in the back. Now my lack shelves will hold a little more than 25 pounds. 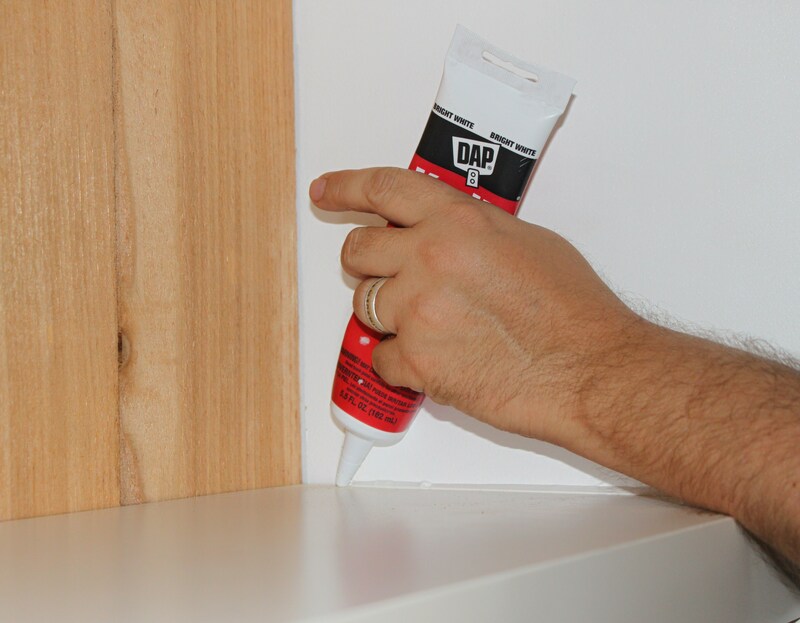 A little line of white bathroom caulk will hide the seams against the cabinets. The cabinets were “Birch” when they used to hang in the “old” kitchen…..but Jamie fixed that with primer and white semi-gloss. Now they are sparkling white in the garage. Here’s what the whole set-up looks like now with the cabinet doors and new handles. Back pats all around on this one….. I suppose you could cut the shelves and brackets to any size that you needed. 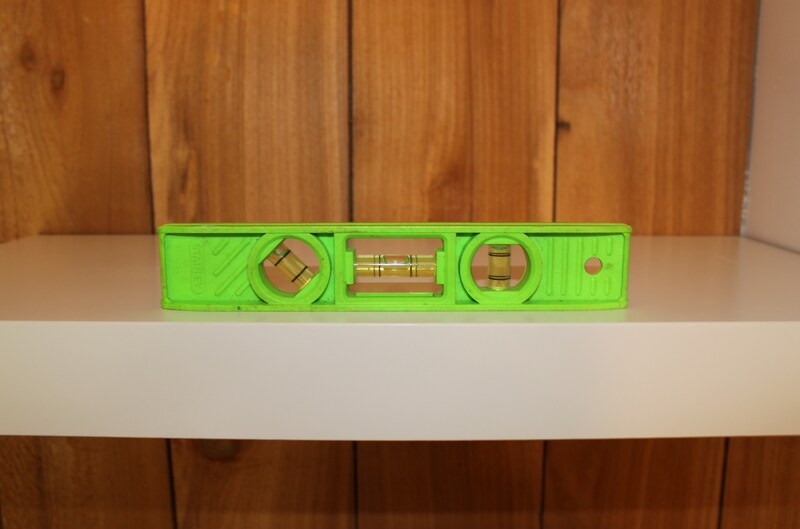 But not too small, or the shelf won’t be attached at 2 studs. I just threw the old tin globes etc. on the shelves to get some pictures, and after all, they were right there in the garage. But…..there is still an ongoing debate in the house as to whether these shelves should be “decorative” or “functional” because they are, you know, in the garage. I’m pretty sure y’all can figure out which side of the debate we are each on……. That looks so AWESOME!!! You guys are are absolutely AMAZING! I would not have thought to hack those Ikea shelves like that but it was genius!!! And what a GREAT LOOKING GARAGE!!! WOW!!! Thank you for sharing!!! 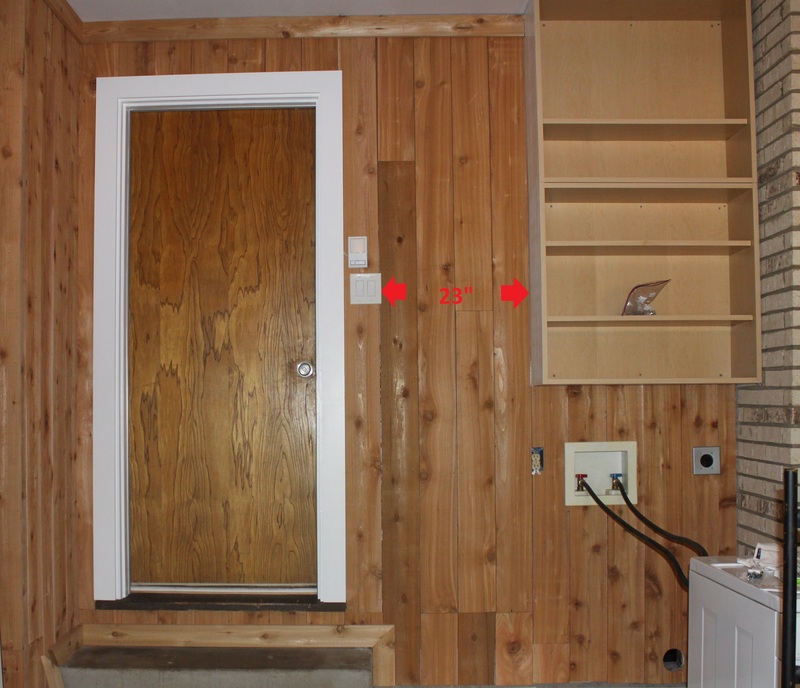 Vickie, we are moving real slow in the gargage…Every time we got to Home depot, we buy 10 more cedar boards….promise to have a “real” reveal in the upcoming weeks….but we had to share this brilliant project while it was still fresh..
OMG! Brilliant use of those Lack shelves! You know, the more I read your blog, the more I think I need to start a globe collection . . .hmmm. This is a really great solution and I love the look. Nice job! 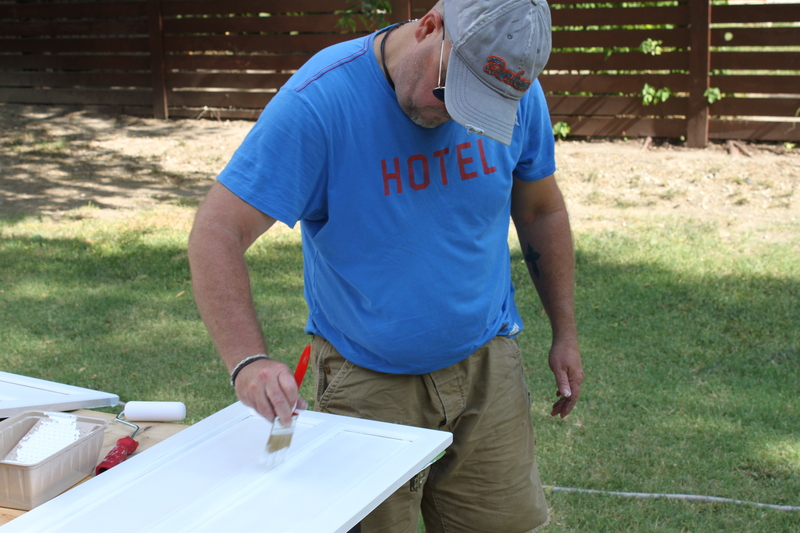 Thanks Anne, some projects just evolve into awesomeness…..
James- what color grout is that? love it. we are redoing our bath w travertine and i want a darker grout but am getting push back! I need to use your pic as proof! Hi there, Great use of the LACK shelf to fit a tight space. Am looking to do the same however the shelves now seem to have two metal posts that support the shelf (as shown in their instructions here: http://www.ikea.com/us/en/assembly_instructions/lack-wall-shelf__AA-572080-3_pub.pdf). When did you buy yours or did you buy special brackets? Hi, I have a pile of these shelves at my warehouse currently. The longer shelves, over 4 feet, seem to have the 2 metal posts. But all the shorter ones that I have, just bought a week ago, have the bracket like the ones I used in our garage. Hope this helps.